September 5, 2012 - The NTSB has recommended that the Federal Aviation Administration require that large airplanes be equipped with an anti-ground collision aid, such as an on-board external-mounted camera system, to provide pilots a clear view of the plane's wingtips while taxiing to ensure clearance from other aircraft, vehicles and obstacles. On large airplanes (such as the Boeing 747, 757, 767, and 777; the Airbus A380; and the McDonnell Douglas MD-10 and MD-11), the pilot cannot see the airplane's wingtips from the cockpit unless the pilot opens the cockpit window and extends his or her head out of the window, which is often impractical. "A system that can provide real-time information on wingtip clearance in relation to other obstacles will give pilots of large airplanes an essential tool when taxiing," said NTSB Chairman Deborah A.P. Hersman. "While collision warning systems are now common in highway vehicles, it is important for the aviation industry to consider their application in large aircraft." May 30, 2012: The right wingtip of an EVA Air Boeing 747-400 struck the rudder and vertical stabilizer of an American Eagle Embraer 135 while taxiing at Chicago's O'Hare International Airport. Embraer 135, registration N834AE, operated by American Eagle Airlines as flight 4265, experienced substantial damage to the rudder and vertical stabilizer when it was struck by a Boeing 747-400, Taiwan registration B16481, operated by EVA Air as flight 661, while the 747 was taxiing at Chicago O’Hare International Airport (ORD), Chicago, IL. The Embraer 135 was entering the ramp area and awaiting ground personnel to guide it to gate G20. The tail section was protruding into taxiway A. The 747 was taxiing westbound on taxiway A in the vicinity of A12 when the right wingtip contacted the Embraer 135's rudder and vertical stabilizer. 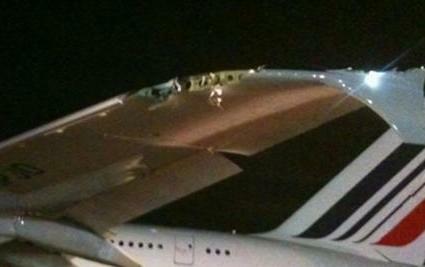 There was minor wingtip and slat damage to the 747. There were no injuries to the 3 crew and 18 passengers on the Embraer 135 or the 3 crew on the 747. The Embraer 135 was operated under the provisions of 14 Code of Federal Regulations Part 121 as a scheduled domestic passenger flight, and the Boeing 747-400 was operated under the provisions of 14 Code of Federal Regulations Part 129 as a scheduled international passenger flight. Visual meteorological conditions prevailed at the time of the accident. On 14 July, 2011, Delta B767-300ER, registration N185DN, operating as Delta flight 266, was taxiing on TWY B for departure on RWY 04 of Boston Logan International Airport. An Atlantic Southeast Airlines CRJ900, registration N132EV, operating as ASA flight 4904 was number 3 in line on TWY B for departure of RWY 09. As the B767 approached and passed the intersection with TWY M, the left winglet of the B767 struck the horizontal tail of the CRJ900. The CRJ900 sustained substantial damage to the horizontal tail, vertical tail, and lost fluid in all three hydraulics systems. Parts of the B767 winglet was sheared off and embedded in the horizontal tail of the CRJ900. The passengers on the CRJ900 were deplaned on the taxiway, and the B767 taxied back to the terminal. No injuries were reported on either aircraft. On April 11, 2011, about 2006 EDT, an Airbus A380, F-HPJD, collided with a Bombardier CRJ 701, N641CA, while the Airbus was taxiing for takeoff from John F. Kennedy International Airport (JFK), Jamaica, New York. At the time of the accident, the CRJ was stationary with part of the airplane on the Comair/Delta parking ramp and its tail extended onto “Mike” taxiway. The CRJ was waiting for ramp clearance to its parking spot. The A380 was carrying 485 passengers and 25 crewmembers, and none were injured. The CRJ was carrying 62 passengers and 4 crewmembers, and none were injured. Both the Airbus and the CRJ sustained substantial damage.